I learned of Ted Andrews’ Animal Speak several years ago, and have referred to it often to add layers of depth and understanding to the moments when the representatives of the animal kingdom touch my own life in some way. I’ve recently thought that it would be great to take a workshop with Mr. Andrews; and when I went to his website to see what his upcoming schedule might be, I read that he had passed away last year on October 24, 2009. Truly a man of many talents and interests, Ted Andrews was a bestselling author of over forty books which have been translated into more than two dozen languages. Some of his interests included hypnosis and acupressure; healing with sound, music, and voice; study and use of herbs; past life analysis; dreams interpretation; and auras. But he was best known for his work with animals. Mr. Andrews was a long time volunteer at the Brukner Nature Center in Troy, Ohio; and held state and federal permits to work with birds of prey, regularly performing wildlife rescue and rehabilitation. He was a champion of animal rights, conducting animal education and storytelling programs accompanied by his own animals in school classrooms. One of my most memorable and moving experiences with the animal kingdom was in 2003 when I received word that my cherished position as librarian in a children’s hospital was to be cut in half due to the economic downturn. My assistant’s job was to be eliminated completely. Later that afternoon, upset and angry, I decided to take a walk to a nearby park to clear my head. As I walked along the sun-dappled path watching the leaves of autumn flutter through the air, I was startled by a huge movement just behind me. I turned to see a great swooping of wings not more that five feet away, and then she lifted off – a beautiful and powerful red-tailed hawk! I was shaken but inspired, and felt that there was a message for me in the encounter. 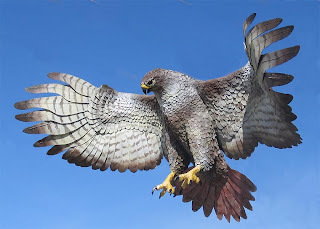 Later, when I looked up red-tailed hawk in Animal Speak, I learned that this bird helps us discover our true purpose in life; and shows up to remind us that there is always a bigger picture to consider when things are not going well. It was certainly no coincidence that only a week before the hospital layoffs, I had completed the final phases of my Feng Shui training, and received my certification. In the intervening years, I have continued to walk this path – learning, growing, and savoring as I visit the homes and businesses of fellow “journeyers”. I often think of that moment in the park as the closing of one door, and the opening of another – with red-tailed hawk showing the way.